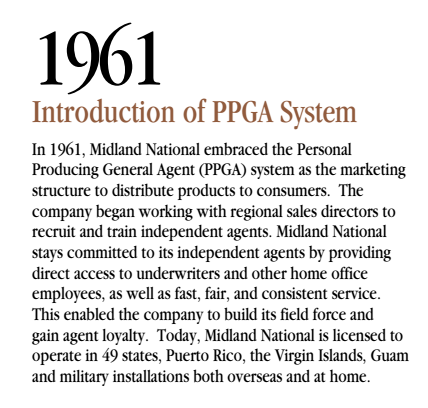 In 1961, Midland National embraced the Personal Producing General Agent (PPGA) system as the marketing structure to distribute products to consumers in the United States. The company began working with regional sales directors to recruit and train independent agents across the country. Midland National stays committed to its independent agents by providing direct access to underwriters and other home office employees, as well as fast, fair and consistent service. This enabled Midland National Life to build its field force and gain agent loyalty. Today, Midland National is licensed to operate in 49 states, Puerto Rico, the Virgin Islands, Guam and military installations both overseas and at home. Read more about the reputation of Midland National Life at the site:Trust Midland National.